Of all the many, many wonderful Bradford City memories that we can take from 2013 and lovingly store forever, it was the scene of May 22, 2013 which deserves a place amongst the most prominent. 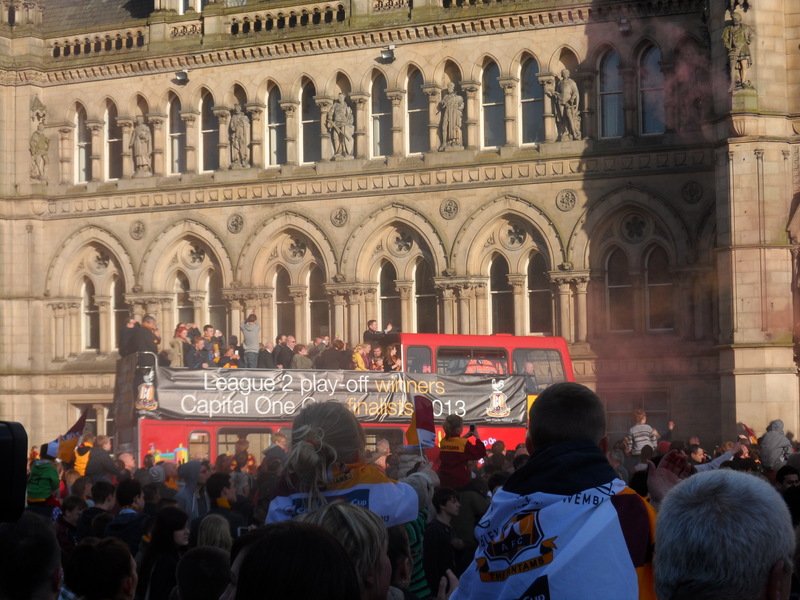 On that sunny, spring evening, thousands packed out Centenary Square to cheer the Bradford City players and management as they completed an open top bus parade around the city. Our League Cup finalists. Our League Two play off winners. Congregating in the heart of the town was not just City supporters, but Bradfordians. A community occasion, one which attracted a wide and diverse range of people. This was not only a moment to celebrate 12 years of football club misery coming to an end, but a gathering of civic pride. And though it sounds like some terrible cliché; as we headed back to the car afterwards, walking in front of us was an Asian family decked out in claret and amber souvenirs, bought from enterprising street vendors at Centenary Square. One of many, many examples suggesting the club’s achievements had touched more than just those who have been regularly setting foot inside Valley Parade over recent years. 2013 was not without its problems, but in many ways proved a very good year for Bradford. It was a year where the threat of closure of a unique landmark – the National Media Museum – was memorably challenged by a public already scarred by so many other Bradford buildings and attractions taken away. The campaigning helped to result in the museum’s owners, the Science Museum Group, shelving their plans, and the National Media Museum is still with us. It was the year when a Bradford Jewish synagogue was saved by its Muslim community. A year where – hold the front page here – Westfield finally gave a firm commitment to build that bloody shopping centre they promised us over a decade ago, before they left us with an embarrassing hole in our city centre. And it was the year when Bradford City caught the local and national public imagination, generating with it so much goodwill. The improbable journey of a League Two club reaching the League Cup Final. As the world’s media descended upon Valley Parade in the build up to the Wembley meeting with Swansea City, the angles they covered stretched beyond the miracle of Phil Parkinson’s management and the working class hero, James Hanson; and to examining the city itself. Broadsheets, and your more serious news shows, in particular took an in-depth look at how Bradford the place was holding up in 2013, revisiting a city that had not been so vividly in the national and international spotlight since the race riots of 2002. The football team that represented the city had performed incredible heroics against all odds, and it wasn’t a surprise that the media searched for a connection between a League Two club beating three Premier League sides and a city riddled with so many problems, trying to bounce back from the severe global economic downturn. What can bring Bradford together? Two days after the League Cup Final, I was a guest panellist at a British Future think tank event held at Bradford’s Carlisle Business Centre, barely a mile from Valley Parade. The event was to publically debate the question: “What can bring Bradford together?” and what came across from the audience that night was the feeling of community inclusion that City’s cup run had sparked. Although within our fanbase there had been some disquiet about whether certain people ‘deserved’ to attend the Wembley occasion, the general feeling was that new, lapsed and existing supporters of the club all bonded together well and contributed to a stunning atmosphere. As Labour Councilor Jan West stated on the night, “The Wembley crowd was very different to a normal Bradford City crowd. It certainly had a bigger racial diversity. But the other thing that is increasingly expanding is the number of women going, and the amount of different ages, from people who are quite elderly, right down to young kids. You had people with disabilities, I saw a lot of people in wheelchairs. It would have been easy for that to have proven the peak moment and for the Bantams to return to their perennial mediocrity, loved only by an ever-dwindling support. But the club, which walked out at Wembley to face Swansea lying in 12th place in League Two, overcame the odds once again to book a second trip to Wembley, for the League Two Play Off Final. And though this time the number of City supporters who descended upon Wembley Way was lower, the 24,000 who did still makes for an impressive number (over twice the club’s average Valley Parade attendance for the 2012/13 season). There is an never-ending temptation for those within football – and certainly those who cover it – to overplay the sport’s role on regular people’s lives. No one should believe that the Bantams winning a few football matches can fundamentally change the city it represents. But still, there is no doubt that the achievements of those in claret and amber have made a positive difference, beyond regular supporters. City’s achievements have brought people together. City’s victories have won hearts and minds, resulting in new Bradford City supporters. In these times of identikit cultures where every town and city centre is uniformly the same, Bradford’s professional football club has offered a sense of identity that residents can take pride in. The legacy of City’s unprecedented 2012/13 season can be seen in the way that crowds have swelled at Valley Parade for our 2013/14 League One adventure. This includes the fantastic re-launch of a community enclosure, which is packed out for almost every game. There has been a tremendous atmosphere inside the ground this season, with so much noise, singing and positive backing for the players. As a seasoned watcher, I have found visiting Valley Parade this season to be hugely special, and it reminds me of what it was like when I first discovered Bradford City. I’d like to think that a new generation are currently going through what we all did when we first caught the Bantams bug. I’d like to think that it will stand the club in good stead for years to come. Bradford City has become an exciting attraction for its community. Valley Parade is a place where young and old can sing and cheer together for a common cause. The players are celebrated heroes, whose fame stretches beyond the four sides of the stadium they regularly appear in. This year, James Hanson turned on the Bradford Christmas lights. The guy who worked in a local Co-op and scored the goal that took City to Wembley, now the subject of a children’s book. An inspiration to so many people: who else could have turned on the lights, in this year of all years? As we move into 2014, questions need to be raised about whether the positivity of 2013 on Bradford the city can be continued – or even if we want it to be. A bright start to life in League One understandably raised expectations in us all, but as City drift away from the play off picture and star striker Nahki Wells looks set to exit soon, a debate about the financial practicalities of continuing our progress has seen the well-established season ticket initiative be criticised by many of the supporters who have benefited from it. For all of City’s years of struggle in League Two, the cheap season tickets was one (sometimes the only) thing to be proud of as a supporter. It was a shame that it took so long for success to occur on the pitch, and it meant crowds dwindled significantly. But the combination of cheap season tickets and belated footballing progress has resulted in higher crowds and wonderful atmospheres. There are calls to significantly increase season ticket prices for next season. That the cheap initiative will hold us back from progressing and achieving the long-term goal of Championship football. With no sign of a rich investor, the club’s future fortunes are intrinsically linked to gate receipts. It is a big dilemma for sure, but I’d personally find it hugely depressing if – at the point where interest in Bradford City is its highest in a decade – we price out a number of people by ramping up the cost of watching the Bantams. There is a good portion of us die-hards who will purchase a season ticket whatever the cost – and less of us paying more would probably result in more overall revenue – but the objectives of this club should not be restricted to winning on a Saturday or getting promoted, we need to continue building up the strength of our club. I first started watching City in the mid-90s. During that era, average attendances tripled in under five years. The spectacular achievements on the field ultimately helped to attract so many new supporters, but the cheap prices at that time were a big help, too. It would cost me a fiver to stand on the Kop. The year City were promoted to the Premiership, my student season ticket cost just £66. Players like Edinho, Nigel Pepper and Darren Moore captured my heart and imagination, but none of that would have been possible if the cost of watching my new-found heroes was beyond my means. The modern day Bradford City has a chance to replicate that era of progress – and keeping ticket prices affordable should be considered a key part of that strategy. This was the year that the city of Bradford rediscovered and fell in love with its professional football club, and now we have to ensure that continued progress does not come at the cost of closing the doors on the wider community.